Blueberry is very low in calories. 100 g fresh berries provide only 57 calories. However, the berries contain health benefiting soluble dietary fiber, minerals, vitamins, and pigment anti-oxidants that contribute immensely for optimum health and wellness. Blueberries are among the highest anti-oxidant value fruits, which help rid off harmful oxygen-derived free radicals from the body, and thereby, protect the body from cancers, aging, degenerative diseases, and infections. In addition, research studies suggest that chlorogenic acid in these berries help lower blood sugar levels and control blood glucose levels in type-II diabetes mellitus condition. Fresh berries contain small amount of vitamin C, vitamin A and vitamin E and good amount of minerals like potassium, manganese, copper, iron and zinc. 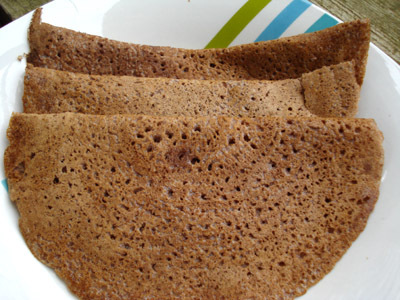 Fingermillet known as Ragi or Nachni in different Indian languages, is a wonder food to strengthen the bones. We all know that Calcium is the mineral that is required for building bones, and fingermillet is loaded with it. Pearl and little millet are higher in fat, while finger millet contains the lowest fat. With Calcium as high as 294 to 390 mg per 100 g, it stands on the top of the list of grains. Studies conducted in nine- to ten-year-old girls showed that replacement of rice in a rice-based diet with finger millet not only provided greater energy balance and prevented muscle loss, but also improved calcium retention. Thus finger millet could be used to overcome the calcium deficiency of a rice diet. As all the millets are gluten free and are not like wheat, they are suitable foods for those with celiac disease or other forms of allergies/intolerance of wheat. 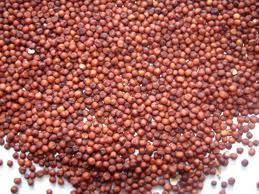 Also, finger millet has greater amounts of Fibre than wheat. However, millets are also a mild thyroid peroxidase inhibitor and probably should not be consumed in great quantities by those with thyroid disease. Fermentation, soaking, malting are the various procedure to increase the assimilation of its varied nutrients. In India, dieticians and pediatricians suggest weaning toddlers with finger millet porridge due to their high nutrition profile and easy digestibilty. Infact, I would highly recommend this grain for weight loss too, as researches have proven that high dietary calcium intake does lead to weight loss. One can use Finger millet to make sweet or savoury items like porridge or simply use the ground flour to make pancakes, flat breads, cakes, (cake recipe - http://litebite.in/eggless-finger-millet-ragi-chocolate-cake-recipe/ ) cutlets, tortillas, drinks etc. Here is the recipe of an easy to make, filling and a cool drink for summers! 1 Soak the ragi flour in the buttermilk overnight. 2 In the morning keep the 3 cups of water on flame to come to a boil. 3 Add 1 tsp salt in the water. 4 when the water starts to boil slow the flame and slowly pour the ragi and buttermilk mixture with continuous stirring so that lumps do not form. 5 let it come to boil on a very low flame and with continuous stirring. 6 After it boils remove it from flame and keep it to cool. 7 while serving add the finely chopped onion and garlic and mix with buttermilk to dilute it as required and serve. Note:- If you cannot soak the ragi for overnight at least soak it for 2 hours. Oregano - the appealing herb! The herb is rich in poly-phenolic flavonoid anti-oxidants (vitamin A, carotenes, lutein, zea-xanthin and cryptoxanthin) and has been rated as one of the plant source with highest anti-oxidant activities. These compounds help act as protective scavengers against oxygen-derived free radicals and reactive oxygen species (ROS) that play a role in aging and various disease process. The active principles in the herb may increase the motility of the gastro-intestinal tract as well as increase the digestion power by increasing gastro-intestinal secretions. This exotic herb is an excellent source of minerals like potassium, calcium, manganese, iron, and magnesium. Potassium is an important component of cell and body fluids that helps control heart rate and blood pressure caused by high sodium. Manganese and copper are used by the body as co-factors for the antioxidant enzyme, superoxide dismutase. Iron helps prevent anemia. Magnesium and calcium are important minerals for bone metabolism. Fresh herb is an excellent source of antioxidant vitamin, vitamin-C. Vitamin C helps body develop resistance against infectious agents and scavenge harmful, pro-inflammatory free radicals. Oregano is a proven super "functional food". This herb is one of the foundation bases of healthy Mediterranean diet in addition to olive oil, fish and lots of greens, herbs and vegetables. No added preservatives, healthy and cheap cereal mixes! Do you feel the pinch of expensive cereal mixes for kids? Try this! When u want to feed your toddler with the best, nutrition packed, quick & easy to make item, the one thing that strikes one as a parent is formula feed, available in 100's of brands with a higher end price tag. Now, what if I suggest something that fulfills all the above requirements without hurting your pocket. When you shop for baby foods, lookout for malted cereal (multigrain) flours, or a protein + cereal mixed flours known as Sattu in India. These mixes are prepared by small scale industries and therefore do not contain no preservatives and artificial colours. Hey are also very cheap and easy to prepare. Just add a tbsp or two in a 150 - 200 Ll milk and boil. Switch off the dame and add sugar and nuts powder (optional) and serve.